ISSA Today is an online magazine produced by the worldwide cleaning association ISSA, who are based in the United States. 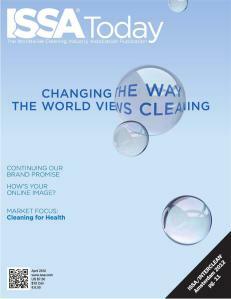 An article in their April edition called “Changing the Way the World Views Cleaning” featured comments I’d made in a transatlantic interview I did with them via Skype. Below is part of that interview, there is also a link at the bottom of the page to the complete article. Inbound Marketing is totally irrelevant to the commercial cleaning industry. Or so a well-respected UK publisher once said, I wholeheartedly disagree. What is A QR Code And Why Do Businesses Need Them? They come to us from Japan where they are very common. QR is short for Quick Response (they can be read quickly by a cell phone). They are used to take a piece of information from a transitory media and put it in to your cell phone. You may soon see QR Codes in a magazine advert, on a billboard, a web page or even on someone’s t-shirt. Once it is in your cell phone, it may give you details about that business or details about the person wearing the t-shirt, show you a URL which you can click to see a trailer for a movie, or information on a product, or it may give you a coupon which you can use in a local outlet.